The church at East Richmond Cemetery, which dates to the 1850’s, is undergoing restoration begun by a descendant of the church’s Norwegian-American founders. The Walworth County Cemetery Association had its summer meeting in a church that hadn’t been used in 90 years. The church at East Richmond Cemetery – hidden behind foliage off a gravel frontage road along Highway P less than a mile north of Highway A – was falling apart until about seven years ago. 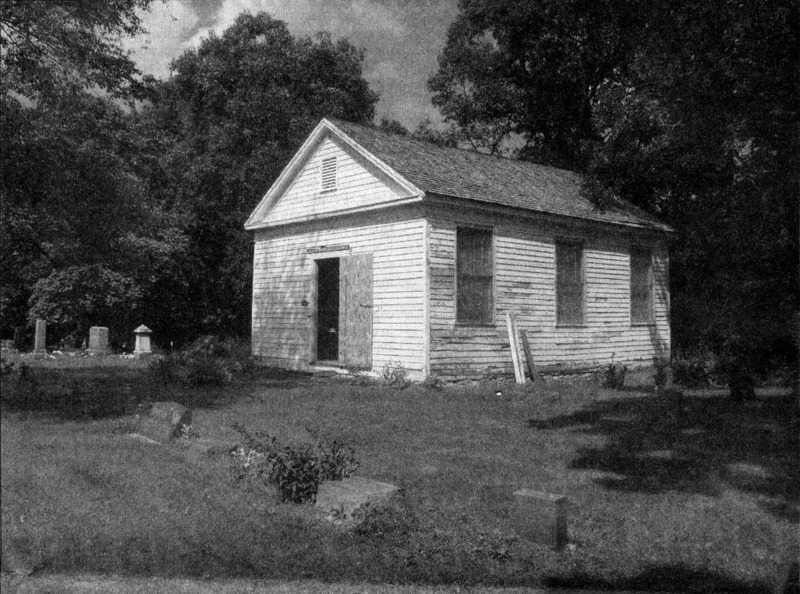 The secluded church built in the 1850’s had been vandalized over the years, and young people had had parties there, said Georgia Kestol-Bauer, whose descendants were among the original members of the church. Kestol-Bauer said the church’s pews were gone, windows were broken, the organ was missing, the floor was riddled with holes and the boards of the ceiling were falling down. The church had been boarded up and could not be entered, and the Town of Richmond was considering demolishing it because of safety concerns. Kestol-Bauer knew if something weren’t done with the historic church, which lays claim as the second Norwegian-American Methodist-Episcopal church in the world, it would collapse from disrepair or be razed. “It was just something that was always in the back of my mind that it would be nice to have it restored,” she said. The church was founded in the 1850’s by three of Kestol-Bauer’s ancestors who sailed to America together from Norway and settled between Delavan and Whitewater – her great grandmother, Anna Steenson Kestol, and her great-grandmother’s brother and sister, Christopher Steenson and Caroline Steenson Johnson. Kestol-Bauer lives on the Territorial Road homestead her great grandparents, Anna Steenson Kestol and Peder Kestol established in 1851 – presumably around the same time they established the church. Kestol-Bauer said the church is unusual in that it was founded by Norwegian immigrants, who are typically Lutheran, in a Methodist-Episcopal denomination. The first pastor of the church was a “circuit rider,” meaning he rode his horse around to conduct services at various locations, Kestol-Bauer said. The Rev. Christian Willerup was based out of Cambridge where the Willerup United Methodist Church, which lays claim as the first Norwegian-American Methodist-Episcopal Church in the world, still operates. The Richmond church is believed to have operated as a parish from the 1850s until around 1900. “We don’t know exactly,” Kestol-Bauer said. Handwritten pen-and-ink ledgers from the late 1800s, which have been in Kestol-Bauer’s family since the early 1900s, show X’s through the names of members who moved or died. Several members relocated to Cambridge, Kestol-Bauer said. and she believes membership might have begun to dissipate when the Richmond Methodist Church was built on Highway A in 1872. Despite the dissolution of the parish, Kestol-Bauer’s uncle, Joey Kestol, she said, recounted social affairs being held there in the early 1900s. She said women would make box lunches, men would bid on them and the winning bidder would dine with the lady who brought the lunch. She said the church was likely last used around 1920. Kestol-Bauer said she would like to restore the church to its original likeness to use for weddings, baptisms, meetings and even church ser- vices from time to time. “My whole goal is to have this be restored historically to the way it was as much as possible,” she said. She began the effort around 2006 when she decided to establish a cemetery association for the plots surrounding the church on the one-acre lot. Kestol-Bauer said her family had sold cemetery plots and maintained the site since the church stopped operating, and that responsibility fell to her when her uncle, Joey Kestol, died in 1995. Knowing nothing about cemetery operations – her uncle had been charging $50 a plot at the time when the going rate was around $300 – Kestol-Bauer attended a meeting of a group in Elkhorn where veterans’ headstones were discussed. Kestol-Bauer suggested to others in attendance that a group of people from various cemeteries get together to discuss their practices. She said the late Charlotte Gates, of the Walworth County Genealogical Society, took the reins and established the Walworth County Cemetery Association, which has operated ever since. When Kestol-Bauer formed an association for the East Richmond Cemetery around 2007, she gauged the interest of area residents who attended the inaugural meeting in restoring the church. “So that’s when we actually got the ball rolling here,” she said. Kestol-Bauer waged a fundraising campaign, collected donations including a $1,000 contribution from one family and accepted memorials to the restoration effort when her father, James Kestol, died in 2004. With the contributions and Kestol-Bauer’s personal funds, the church’s foundation was repaired and a new roof was put on in 2007. She said nothing more was done toward the restoration effort until last fall when another contractor looked at the building and said it needed to be stabilized or it would collapse. Contractors removed the church’s ceiling and installed truss supports and replaced the ceiling and floor with boards like the ones originally used. The wooden altar was also rebuilt at that time, Kestol-Bauer said. Work remaining, Kestol-Bauer said, is to replace the windows, build a railing that once was around the altar, install pews, repair plaster and paint. To do that, Kestol-Bauer said, the project needs funding and manpower. Her daughter, Allison Kestol-Bauer, of Janesville, has created a Web site where people can learn about the project and find out how to donate. The website is www.namech.org, which stands for Norwegian-American Methodist-Episcopal Church. Carol Cartwright, from the Whitewater Historical Society, is applying to have the site listed on the National Register of Historical Places. The designation could provide grant opportunities and would require historically authentic renovations, Kestol-Bauer said. Her goal is to make people aware of the effort and gather “a group of people who think this is a good idea, who are interested in historic preservation,” she said. Kestol-Bauer invited the Walworth County Historical Society to meet at the church July 23. Being able to step in- side was a milestone. She notified area media of the event, and a story appeared in the Janesville Gazette on July 29. After that article, a man from Milton called to offer pews to the church, and a Whitewater woman stopped by the cemetery to ask Kestol-Bauer what she could do. “I want to support it,” said Nikki Knudsen, whose Norwegian family has traveled throughout Wisconsin and to Norway to see Norwegian churches and homesteads. Kestol-Bauer will have an open house from 1 to 4 p.m. Aug. 24 at the church, N7372 Highway P, where people can come to see the church and the cemetery. For more information, contact Kestol-Bauer at (608) 883-2858. Donations can be made to East Richmond Cemetery Church Restoration Fund, First Citizens State Bank, 207 W. Main St., Whitewater, WI 53190. This entry was tagged East Richmond Cemetery, Walworth County Cemetery Association. Bookmark the permalink.